I've completed the back on the sweater I've been knitting. Actually, this picture was taken shortly before I finished the back. 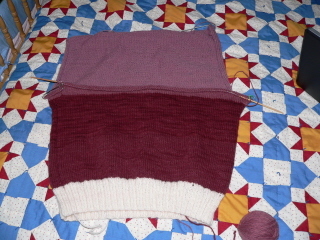 Here, you can see the side of the sweater, with the sleeve gusset and the front on stitch holders. Later in the evening, I finished the back and put those stitches on stitch holders. 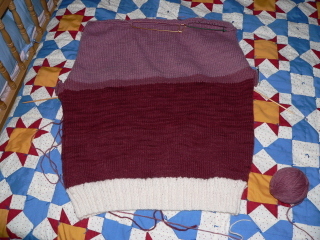 This is the front of the sweater, with the stitches now on the needle. And this is the completed back, with the stitches separated on stitch holders (shoulder seam stitches on two holders and the stitches for the neck on a separate holder). Moving right along. I stayed up a little later last night because I just wanted to be able to say I had the back finished and was working on the front. You can even see a little of the color variations in these pictures. I really like it. Jan and I are meeting today in Poughkeepsie, of all places, to see Douglas perform in a reading of a new musical called Jerry Christmas. A few of the California contingent of fans will also be attending and this has become a regular get-together of sorts. We're meeting for dinner tonight and brunch tomorrow morning. 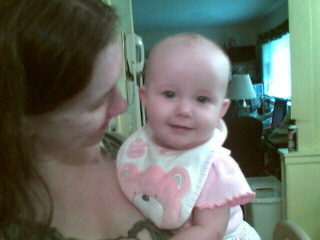 Yes, I'll bring the camera, along with pictures of Lorelai! We're suffering with the humidity. That's why Pooh's resting. I just got a new cell phone. My charger wasn't working right on the old phone, not making a good connection, though the phone was working fine. But when I went to the Sprint store, I discovered that they have a promotion now and I was eligible for $150 off on a new phone. So, I picked out a new one with a camera. It's really cool and I'm having fun with it. Here is my new background on the phone. The pictures are not bad. Baby hats for charity. 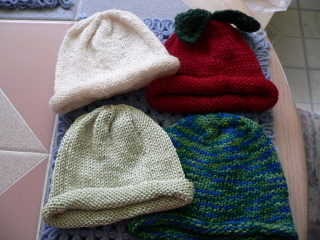 The red one is the apple hat, the first one I made for this project. 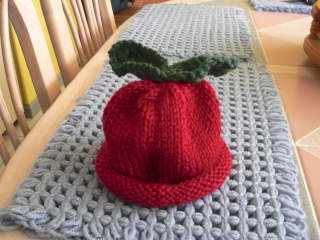 Here's a better picture of the apple hat. This one is made from 100% acrylic yarn which is very soft. The other hats are made from 100% cotton (bottom left), wool/nylon blend (bottom right) and 100% wool (top left). They're so fast to make. I predict that Lorelai will have many hats this coming winter. I'm still working on the gansey sweater. 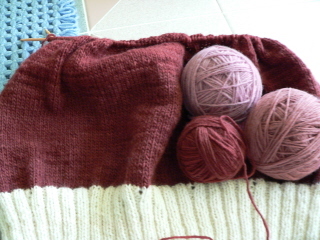 I have it divided for armholes now and I'm working on the back. The gussets and front are on stitch holders. It's moving along quickly. It's almost lunchtime and I can't decide what I'd like for lunch. I'm sure I'll find something. We only have four more classes in this summer's ASL class. It goes by so fast. The summer's moving along quickly. Since I don't have anything planned for the fall, it's a strange feeling. I'm taking a break. When I need to find something, I'm sure I will. While in Gettysburg, I found a lovely yarn shop called Misty Mountain Fiber Workshop. 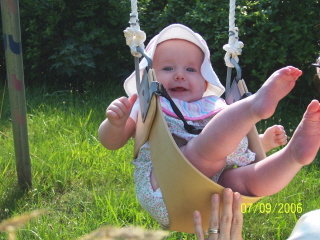 There were materials and things for the spinner and, since I know nothing about spinning, I concentrated on the yarn. Much of the yarn, though beautiful, is available to me here in yarn shops or online. I was looking for something special and I found it in handspun, hand-dyed yarn from a local spinner in nearby Fairfield. I bought beautiful wool in magenta/pink shades. 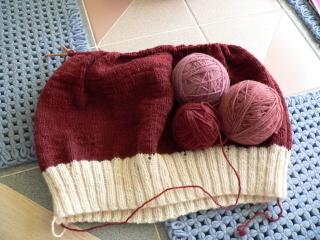 I've started a gansey sweater (knitted in the round) for myself. I wasn't sure if there'd be enough yarn for a whole sweater as the package says it is enough for a sweater vest. So, I decided to use natural wool (also from Misty Mountain) for the ribbing, in the hopes that I can complete this sweater with the yarn I have. I've started with the darker shade and I'll continue with the next shade and then the lighter shade. At the rate I'm going, I think I'll have enough. I have one ball of the next shade and four of the lightest shade and this is the second of the darker color. This wool is heavenly to knit with. I'm using wood circular needles and the wool just glides through them so easily. It's a pleasure to knit. It's a little difficult to see in the picture but the yarn has almost a variegated look to it, I suppose due to the dying process. The dye isn't completely even and it gives it a really pretty look with the different shades of the color. 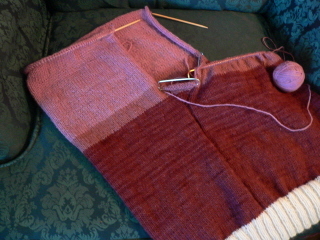 I'm about an inch away from starting the underarm gusset. I'm so anxious to see how this looks when it's done. Here's a picture of the side of the Farnsworth House Inn. Can you make out the white paint? Those spots show you the bullet holes from the battle in Gettysburg. There are over 100, I believe. It's a little difficult to see but you can just make out the white spots on the left side of the building, behind the sign. After touring Gettysburg, we decided late in the week to take a ride to Antietam, Maryland, the site of another devastating battle of the war. This one took place on September 17, 1862 and was the Union victory (however slight) which prompted Lincoln to announce his Emancipation Proclamation. The battle was particularly brutal, with the greatest loss of life in one day in our nation's history, 23,000 casualties (killed and wounded). When we arrived, we were just in time for a talk by a park service employee, which was about 25 minutes long and very detailed. I mean, this guy knew his stuff. The visitor's center is on the highest point on the battlefield (where Lee was positioned at the beginning of the battle) and the park ranger could point out what happened where from where we were. Pretty amazing. Here is some information about the battle itself. 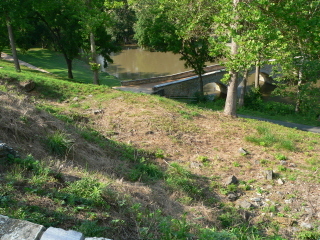 Burnside Bridge, taken from the site of the Confederate position. 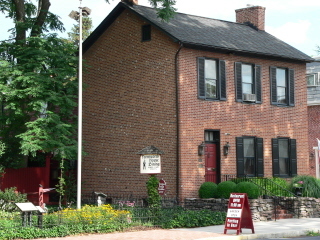 Since we have our favorites in Gettysburg, having visited there often, we once again had dinner at the Dobbin House. Delicious! Their breads alone are worth the trip. We did the auto tour again, twice actually. We did some walking around the center of town (which has a traffic circle known as Town Square. Strange.) and shopping. It was a nice, relaxing week. This morning, I discovered that something must have splattered in the living room last night, presumably while I was at school teaching. I noticed something on the walls when I arrived home and cleaned that up. This morning, I found some kind of red sauce on the ceiling. Hmm, that's interesting. I checked with the other inhabitants of the house and no one seems to know how that happened. I cleaned it up, I'm just wondering how it happened. Sigh. The heat wave apparently has been broken, by some rather nasty thunderstorms last night which showed up just as I was attempting to sleep, of course. The lights blinked twice but, thankfully, we didn't lose power. However, I did turn off the computer and air conditioner, just in case, to prevent anything from getting zapped. I think I've gotten everything caught up. ta-ta, all! Getting back to the recent trip to Gettysburg, once again, we had lunch at Farnsworth House Inn. This time, I bought their cookbook, which has some information about the Inn over the years. The original part of the house was built in 1810 and the brick part of the house was added in 1833 by the owner at that time, John McFarland. At the time of the battle, a man named Sweeney owned the house. He lived there alone, since he and his wife had separated. She was living with another family in town with her daughter, Elizabeth. Elizabeth inherited the house from her father and lived there until she married and moved. So, why is it called the Farnsworth House? Good question. It is named for Brigadier General Elon John Farnsworth, who was killed during the battle at the age of 26. The most interesting part of the cookbook is a list of the price of groceries at the beginning and end of the war. It's astonishing! In 1860, the price of flour was $8.50 bbl (which I assume means "barrel"). In 1864, the price had jumped to $500! Bacon was 12 cents a pound in 1860 and in 1864, it was $8. Butter went from 25 cents to $25, potatoes from $1.00 a bushel to $40 and candles from 15 cents a pound to $10 a pound. 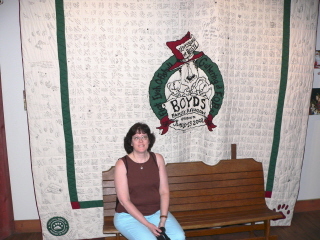 Here I am at Boyds Bear Country, sitting in front of a beautiful quilt. Yes, I enjoyed another visit to the three story Boyds Bear Country. We even had lunch there this time. You could just spend the day, it's so much fun. Anyway, I think there's a club you can join at Boyds, where you get special deals and such, and this is a quilt signed by members of this club. All those little squares are signatures. It's from a "Boyds family reunion". It was really nice. This picture is of "the angle", where Pickett's charge took place. Can you imagine soldiers marching across this open space? That grove of trees on the right is as far as the confederate soldiers made it. 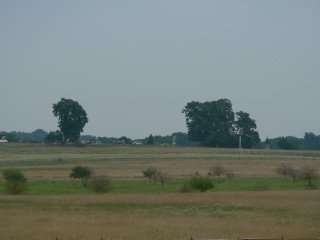 This picture was taken from the site of Lee's statue, the Virginia monument, which is placed at Lee's position during the battle. 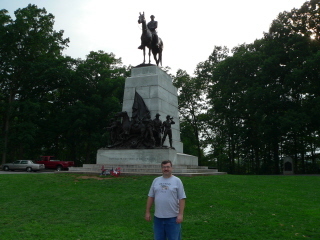 Here's Bill in front of the Virginia monument, Lee on his horse, Traveler. The auto tour cd said that this is said to be the best horse ever sculpted. Back to L.I., we've been having a serious heat wave with temps in the 90's. Thank goodness for a/c. The forecast is for possible thunderstorms tonight, which should give us a break from the heat. Tomorrow's forecast is for a high of 80. Big difference! 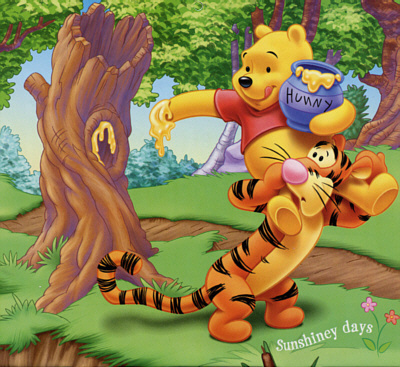 Pooh and Piglet know how to beat the heat! 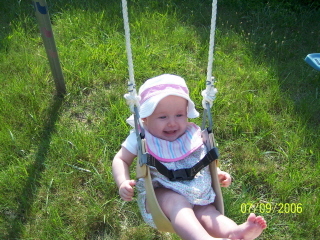 Yesterday, I got out the baby swing for the old swing set to see how Lorelai would like it. She's a real daredevil. Hee-hee! Oh, bother, as Pooh would say. It looks like I've started another month pretty darn late. My excuse this month is that Bill and I just arrived home yesterday from another vacation to the Gettysburg, PA area. I usually post journal entries from the trip but this time, the internet connection was so slow, it would have been so frustrating. So, I'm going to try to catch up on the trip story over the next few days. Our main reason for visiting Gettysburg this year was to see the just opened show, For The Glory, at the Majestic Theatre. This show originally appeared on Broadway as The Civil War, a show I saw five times. I love the music and was excited to see it again. It has been scaled down and is a concert version of the show, which it really should have been all along. On Broadway, the creative team tried to make it a book musical but, although the music is absolutely beautiful, it didn't work as a book musical. This version is great and it appears that the creative team paid close attention to fans' opinions as the best parts of The Civil War remain in this version. We saw the Wednesday matinee of the show, on July 5th. The only disappointment was that Rob Evan, who plays the Confederate captain, was out that day. His understudy was very good and his rendition of "Virginia" definitely won me over but I would have loved to hear Rob Evan sing those songs. It was really nice seeing Michael Lanning and Keith Byron Kirk again, since they'd been in the original Broadway production as well. The ensemble, particularly the slave ensemble, is very good. It was great to hear my favorite songs, including "River Jordan" and was excited that "Old Grey Coat", which was on the concept album but not in the Broadway production, has been returned to the show. Now that I've gotten started, I'll get my pictures organized and try to finish this up in the next few days. Of course, Sundays are pretty much taken up with the lovely Lorelai's visit but I'll get back in gear as the week begins.